The compact, cost-effective PowerLogic® ION7300 power and energy meter is the most economical device in our ION7300 series and is an excellent replacement for multiple analog meters. The ION7300 is a high-accuracy 3-phase power and energy meter that is suitable for use by energy suppliers and energy consumers. 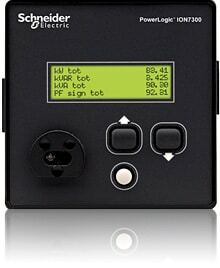 It can be used to track energy costs in industrial/commercial facilities, by department, tenant, process, or output. Used in enterprise energy management applications such as feeder monitoring and sub-metering, PowerLogic ION7300 series meters offer unmatched value, functionality, and ease of use. PowerLogic ION7300 series meters interface with ION Enterprise software, or other power management or automation systems, to provide users with real-time information for monitoring and analysis. PowerLogic ION7300 meters are an ideal replacement for analog meters, with a multitude of power and energy measurements, analog and digital I/O, communication ports, and industry-standard protocols. The ION7330 meter adds on-board data storage, emails of logged data, and an optional modem. The ION7350 meter is further augmented by more sophisticated power quality analysis, alarms and a call-back-on-alarm feature.